Lisa took me out today for an early birthday present. We took a drive over to NOHO (that's North Hollywood) to the El Portal Forum Theatre where we saw the musical, "The Marvelous Wonderettes". The first act is set in 1958 at Springfield High School's Senior Prom. 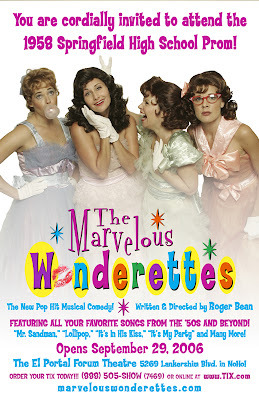 The Marvelous Wonderettes perform songs like "Stupid Cupid" and "Mr Sandman". In the second act, it's 10 years later at the high school reunion with songs such as "Son of a Preacher Man" and "It's my Party". I am so young, I barely knew the songs. It was fun watching the audience dancing during the intermission. I told her my birthday present would be perfect if she would dance on the way out. Which she did. And, the birthday was complete. I had a great time and wanted to thank her for the birthday present! Glad you enjoyed the play. And I'm glad that Lisa danced and made your birthday special!